Vermont Fiber Mill & Studio and Maple View Farm Alpacas will host its annual holiday open house on November 24 and 25 from 11:00 am until 4:00 pm. Guests are invited to learn about alpacas, raised for breeding as well as their luxurious fiber. Visit the fiber mill and see a demonstration of the FeltLOOM, used to create felt fabric. Then browse the farm store for great holiday gifts made from luxurious alpaca. It’s always a fun weekend! 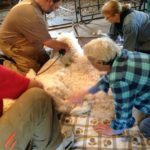 Vermont Fiber Mill & Studio and Maple View Farm Alpacas will host its annual fall open house on September 16 and 17 from 11:00 am until 4:00 pm. Guests are invited to learn about alpacas, raised for breeding as well as their luxurious fiber. Visit the fiber mill and see how yarn is made. It’s always a fun weekend! The mill works with production cycles and we take reservations. We are full for the remainder of 2017 as well as 2018 and into 2019. If you want roving, rug yarn or batts (jobs that are just wash, pick, card), we will be accepting limited jobs to our work-in list late this year and into 2018. We work these jobs in when we are backed up at the spinner. Email vtfibermill@gmail.com if you are interested. Jobs larger than 20 lb and/or wanting other services, like spinning, dyeing, separating or felting should be scheduled in a cycle.